June 25, 1950, the day the Korean War began, is an important date in modern Korean history. More than 7,000 South Korean soldiers, including young students who were then attending Seoul National University, died during the three-year conflict. To commemorate the sacrifices made by members of the university during the war, the Seoul National University Archives has a collection of letters, student ID cards, photographs and other documents of students who passed away. 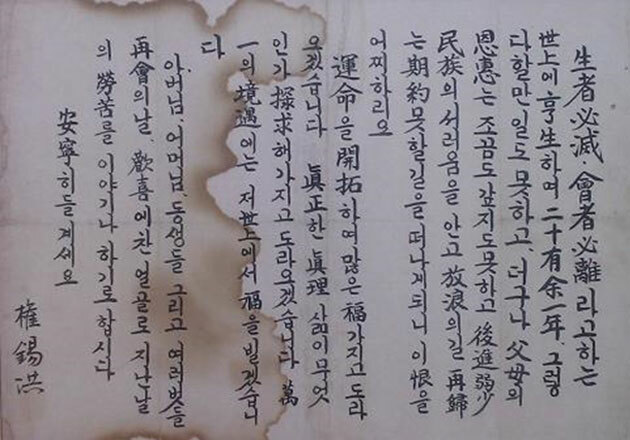 One letter, written by student KWON Seok-Hong to his family before entering the military academy, reads"I will return home after successfully seeking my fate. I will return home with a profound understanding of the meaning of true life. Should anything unfortunate happen, I will pray for good luck in the world after death." 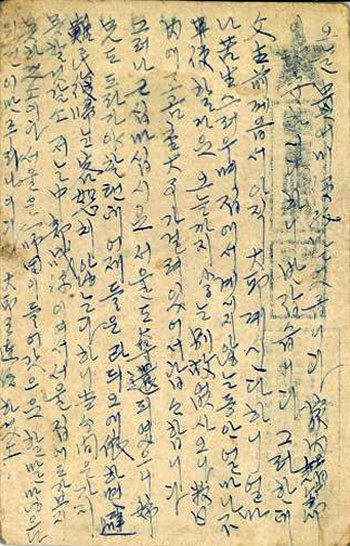 This letter turned out to be the last documented words of Kwon, who was a junior in the Department of Textile Engineering when the war began. Kwon, who had entered the U.S. Field Artillery School, returned to Korea after war conditions worsened, but died while serving as an artillery officer. Expressing his deep sorrow, Kwon also wrote,"In a world where 'all men are mortal' and 'those who return must leave,' I feel great regret that in the past twenty years of my life, I have not been able to accomplish anything significant nor repay my parents. I am saddened that I must embark on a journey with no promise of return in this small and weak country." Another letter from senior KIM Se-Hwan, who was a student in the Department of Korean Language and Literature, to his family reads"Do not worry. Seoul has been won back … but I will not be able to visit home, since I am fighting on the central front." When Kim was killed during a battle in 1951, his poignant reassurances to his parents, wife and young daughter became a broken promise. SNU Archives revealed that they have been able to confirm 23 names of former SNU students who died in the Korean War. In recognition of their sacrifice, the Archives awarded each student with an honorary degree and erected a memorial stone in 1996. However, it is very likely that more unidentified students died as well. During the war, many SNU professors were abducted and taken to the northern side of the peninsula, and many students were conscripted into the volunteer army. In further commemoration, SNU faculty members visit the memorial stone every year in June. SNU Archives intends to continuously collect and systematically organize documents regarding the university's contribution to the war.